This is a homemade baby shower favors tray I recently did for a Baby Shower. 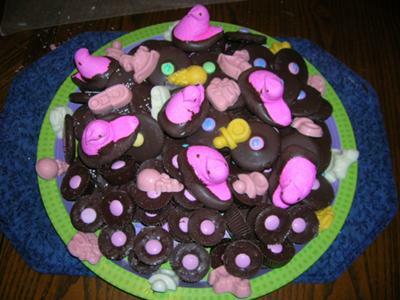 I used (pink) chocolate dipped peeps since the shower was for a baby girl. Chocolate dipped peeps are fun to use for something like this. On the tray are Ritz crackers dipped in dark chocolate mint (taste like girl scout thin mint cookies) & topped with pastel colored M&M's. I also added peanut butter and toasted coconut cluster cups topped with the M&M's . Added molded baby favor pieces to accent the tray.